2011-04-21 Assigned to DURECT CORPORATION reassignment DURECT CORPORATION ASSIGNMENT OF ASSIGNORS INTEREST (SEE DOCUMENT FOR DETAILS). Assignors: MILLER, STACEY S., GIBSON, JOHN W., MIDDLETON, JOHN C., TIPTON, ARTHUR J. The present invention relates to novel nonpolymeric compounds and compositions that form liquid, high viscosity materials suitable for the delivery of biologically active substances in a controlled fashion, and for use as medical or surgical devices. The materials can optionally be diluted with a solvent to form a material of lower viscosity, rendering the material easy to administer. This solvent may be water insoluble or water soluble, where the water soluble solvent rapidly diffuses or migrates away from the material in vivo, leaving a higher viscosity liquid material. This application claims benefit of the filing date of U.S. Ser. No. 09/699,002, filed Oct. 26, 2000, which is a divisional of U.S. Ser. No. 09/385,107, filed Aug. 27, 1999, now U.S. Pat. No. 6,413,536, which claims benefit of the filing date of U.S. Ser. No. 08/944,022, filed Sep. 15, 1997, now U.S. Pat. No. 5,968,542, which is a continuation-in-part of U.S. Ser. No. 478,450, filed Jun. 7, 1995, now abandoned, and which is a continuation-in-part of U.S. Ser. No. 08/474,337, filed Jun. 7, 1995, now U.S. Pat. No. 5,747,058, the entire contents of each of which are hereby incorporated by reference. There has been extensive research in the area of biodegradable controlled release systems for bioactive compounds. Biodegradable matrices for drug delivery are useful because they obviate the need to remove the drug-depleted device. The most common matrix materials for drug delivery are polymers. The field of biodegradable polymers has developed rapidly since the synthesis and biodegradability of polylactic acid was reported by Kulkarni et al., in 1966 (“Polylactic acid for surgical implants,” Arch. Surg., 93:839). Examples of other polymers which have been reported as useful as a matrix material for delivery devices include polyanhydrides, polyesters such as polyglycolides and polylactide-co-glycolides, polyamino acids such as polylysine, polymers and copolymers of polyethylene oxide, acrylic terminated polyethylene oxide, polyamides, polyurethanes, polyorthoesters, polyacrylonitriles, and polyphosphazenes. See, for example, U.S. Pat. Nos. 4,891,225 and 4,906,474 to Langer (polyanhydrides), 4,767,628 to Hutchinson (polylactide, polylactide-co-glycolide acid), 4,530,840 to Tice, et al. (polylactide, polyglycolide, and copolymers), and 5,234,520 (Dunn et al., biodegradable polymers for controlled delivery in treating periodontal disease). Degradable materials of biological origin are well known including, for example, crosslinked gelatin. Hyaluronic acid has been crosslinked and used as a degradable swelling polymer for biomedical applications (U.S. Pat. No. 4,957,744 to Della Valle et al. ; (1991) “Surface modification of polymeric biomaterials for reduced thrombogenicity,” Polym. Mater. Sci. Eng., 62: 731-735]). Biodegradable hydrogels have also been developed for use in controlled drug delivery as carriers of biologically active materials such as hormones, enzymes, antibiotics, antineoplastic agents, and cell suspensions. Temporary preservation of functional properties of a carried species, as well as the controlled release of the species into local tissues or systemic circulation, have been achieved. See for example, U.S. Pat. No. 5,149,543 to Cohen. Proper choice of hydrogel macromers can produce membranes with a range of permeability, pore sizes and degradation rates suitable for a variety of applications in surgery, medical diagnosis and treatment. Many dispersion systems are currently in use as, or being explored for use as, carriers of substances, particularly biologically active compounds. Dispersion systems used for pharmaceutical and cosmetic formulations can be categorized as either suspensions or emulsions. Suspensions are defined as solid particles ranging in size from a few nanometers up to hundreds of microns, dispersed in a liquid medium using suspending agents. Solid particles include microspheres, microcapsules, and nanospheres. Emulsions are defined as dispersions of one liquid in another, stabilized by an interfacial film of emulsifiers such as surfactants and lipids. Emulsion formulations include water in oil and oil in water emulsions, multiple emulsions, microemulsions, microdroplets, and liposomes. Microdroplets are unilamellar phospholipid vesicles that consist of a spherical lipid layer with an oil phase inside, as defined in U.S. Pat. Nos. 4,622,219 and 4,725,442 issued to Haynes. Liposomes are phospholipid vesicles prepared by mixing water-insoluble polar lipids with an aqueous solution. The unfavorable entropy caused by mixing the insoluble lipid in the water produces a highly ordered assembly of concentric closed membranes of phospholipid with entrapped aqueous solution. U.S. Pat. No. 4,938,763 to Dunn, et al., discloses a method for forming an implant in situ by dissolving a non-reactive, water insoluble thermoplastic polymer in a biocompatible, water soluble solvent to form a liquid, placing the liquid within the body, and allowing the solvent to dissipate to produce a solid implant. The polymer solution can be placed in the body via syringe. The implant can assume the shape of its surrounding cavity. In an alternative embodiment, the implant is formed from reactive, liquid oligomeric polymers which contain no solvent and which cure in place to form solids, usually with the addition of a curing catalyst. While a number of materials have been evaluated for use in the controlled delivery of substances, there remains a need to provide more simple systems with low toxicity for the controlled delivery of substances. The delivery systems described above, for example, require the preparation of polymers and loaded polymeric matrices, or hydrogels, or other complex or fragile compositions. In particular, there is a need to provide a liquid-based delivery system that is easily formulated with a substance to be delivered and easily administered. Therefore, it is an object of the invention to provide a simple system for the delivery of substances. It is another object of the invention to provide a liquid-based delivery system that is easily formulated with a substance to be delivered and easily administered. It is another object of the present invention to provide a method for the controlled delivery of substances in a simple liquid-based system. The invention relates to compounds, and to compositions containing them, as well as to methods of using these compounds and compositions as delivery vehicles, for example as controlled delivery vehicles, for substances, such as bioactive substances. The invention also relates to these compounds, compositions, and methods of using them as medical or surgical devices, such as medical or surgical implants, films, or graft compositions. The compositions are generally in liquid form, and contain at least one non-water soluble, high viscosity, liquid carrier material. In one aspect, the invention relates to a liquid composition for the delivery of biologically active substances having (a) a non-polymeric, non-water soluble high viscosity liquid carrier material having a viscosity of at least 5,000 cP at 37° C. that does not crystallize neat under ambient or physiological conditions, and is present in an amount from about 99.5 percent to about 1 percent by weight, more particularly from about 95 percent to about 10 percent by weight, relative to the total weight of the composition; and (b) a biologically active substance. In another aspect, the invention relates to a liquid composition for the delivery of biologically active substances having (a) a non-polymeric, non-water soluble high viscosity liquid carrier material having a viscosity of at least 5,000 cP at 37° C. that does not crystallize neat under ambient or physiological conditions; (b) a biologically active substance; and (c) a solvent in which the non-polymeric non-water soluble liquid carrier material is soluble. In another aspect, the invention relates to a liquid composition for the delivery of biologically active substances having (a) a non-polymeric, non-water soluble high viscosity liquid carrier material having a viscosity of at least 5,000 cP at 37° C. that does not crystallize neat under ambient or physiological conditions; (b) a biologically active substance; and (c) an additive. In another aspect, the invention relates to a liquid composition for the delivery of biologically active substances having (a) a non-polymeric, non-water soluble high viscosity liquid carrier material having a viscosity of at least 5,000 cP at 37° C. that does not crystallize neat under ambient or physiological conditions; (b) a biologically active substance; and (c) a solvent in which the non-polymeric non-water soluble liquid carrier is soluble, and (d) an additive. In another aspect, the invention relates to a liquid composition for the delivery of biologically active substances and suitable for topical, systemic, parenteral, rectal, vaginal, nasal, pericardial, or oral administration, or a combination thereof, having (a) a non-polymeric, non-water soluble high viscosity liquid carrier material having a viscosity of at least 5,000 cP at 37° C. that does not crystallize neat under ambient or physiological conditions; and (b) a biologically active substance. In another aspect, the invention relates to a liquid composition for the delivery of biologically active substances having (a) a non-polymeric, non-water soluble high viscosity liquid carrier material having a viscosity of at least 5,000 cP at 37° C. that does not crystallize neat under ambient or physiological conditions; (b) a biologically active substance; and (c) a lower viscosity liquid carrier material. In another aspect, the invention relates to a liquid composition for the delivery of biologically active substances having (a) a non-polymeric, non-water soluble high viscosity liquid carrier material having a viscosity of at least 5,000 cP at 37° C. that does not crystallize neat under ambient or physiological conditions; and (b) a biologically active substance useful for agricultural, human therapy, veterinary, or pesticidal purposes, or a combination thereof. The carrier material may comprise a nonpolymeric ester or mixed ester of one or more carboxylic acids. In particular, the carrier material can have a viscosity of at least 5,000 cP at 37° C. In addition, the carrier material may possess the property that it does not crystallize neat under ambient or physiological conditions. The compositions can be dissolved in a physiologically acceptable solvent to lower their viscosity, rendering them easier to administer. After administration of compositions containing water-soluble solvents, however, the solvent diffuses or otherwise dissipates away from the material, which thus increases significantly in viscosity, and thereby forms a controlled release matrix for a bioactive substance, or a medical or surgical implant, film, or graft. Non-water soluble solvents may also be used, but will diffuse away from the nonpolymeric ester or mixed ester much more slowly. Dissolution in solvent is particularly useful with nonpolymeric esters or mixed esters having very high viscosities, e.g., on the order of 100,000 cP at 37° C. Some nonpolymeric esters or mixed esters suitable for use in the invention, while having viscosities above 5,000 cP at 37° C., are not as viscous, and may be administered neat, i.e., without the addition of a solvent. In another aspect, the invention relates to a method of administering a biologically active substance to a plant or an animal (including humans) by administering to the plant or animal a composition containing a non-water soluble, high viscosity, liquid carrier material comprising a nonpolymeric ester or mixed ester of one or more carboxylic acids, having a viscosity of at least 5,000 cP at 37° C., that does not crystallize neat under ambient or physiological conditions and a biologically active substance. The particular method of administration may vary, and may include topical, oral (e.g., as a solution, emulsion, or in a gelatin capsule), nasal, pulmonary, rectal, vaginal, or injectable routes for animals, and topical or injectable routes for plants. In another aspect, the invention relates to a medical or surgical implant, film, or graft composition containing a non-water soluble, high viscosity, liquid carrier material comprising a nonpolymeric ester or mixed ester of one or more carboxylic acids, having a viscosity of at least 5,000 cP at 37° C., that does not crystallize neat under ambient or physiological conditions. (2) allowing the solvent to dissipate or diffuse into the tissue of the patient, thereby forming an implant, film, or graft of the non-polymeric, non-water soluble, high viscosity liquid carrier material. In an even more particular aspect of the invention, the mixture has a viscosity of less than approximately 6,000 cP, more particularly less than approximately 4,000 cP, even more particularly, less than approximately 1,000 cP, at 37° C.
wherein R1, R2, R3, and R4 are independently selected from the group consisting of hydrogen, alkanoyl having 2 to 6 carbons, hydroxy-substituted alkanoyl having 2 to 6 carbons, and acyloxy-substituted alkanoyl having 2 to 6 carbons, and wherein at least one of R1, R2, R3, and R4 is other than hydrogen. The liquid compositions of the invention can be used in any of the utilities or applications disclosed for HVLCM or LVLCM in U.S. Pat. Nos. 5,968,542 and 5,747,058, the entire contents of each of which are hereby incorporated by reference. The invention can be better understood by reference to the following illustrative drawings, which are intended to illustrate and not to limit the scope thereof. FIG. 1 is a graph showing the cumulative release profiles for bupivacaine from decaglycerol tetraoleate and from a 1,6-hexanediol lactate ε-hydroxycaproic acid according to the invention. FIG. 2 is a graph showing the cumulative release profile for estradiol from a glycerol lactate glycolate according to the invention. FIG. 3 is a graph showing the cumulative release profile for progesterone from a 1,6-hexanediol lactate glycolate according to the invention. FIG. 4 is a graph showing the cumulative release profile for lysozyme from hexaglycerol dioleate and a glycerol lactate glycolate according to the invention. FIG. 5 is a graph showing the cumulative release of cromolyn sodium from poly(carpolactone) particles suspended in an SAIB/benzyl benzoate formulation according to the invention. FIG. 6 is a graph showing the cumulative release of cromolyn sodium from a formulation of SAIB/benzyl benzoate containing polymer additive according to the invention. The high viscosity liquid carrier material should be selected that is non-polymeric, non-water soluble, and has a viscosity of at least 5,000 cP, (and optionally at least 10,000, 15,000; 20,000; 25,000 or even 50,000 cP) at 37° C. that does not crystallize neat under ambient or physiological conditions. The term “non-water soluble” refers to a material that is soluble in water to a degree of less than one percent by weight under ambient conditions. The term “non-polymeric” refers to esters or mixed esters having essentially no repeating units in the acid moiety of the ester, as well as esters or mixed esters having acid moieties wherein functional units in the acid moiety are repeated a small number of times (i.e., oligomers). Generally, materials having more than five identical and adjacent repeating units or mers in the acid moiety of the ester are excluded by the term “nonpolymeric” as used herein, but materials containing dimers, trimers, tetramers, or pentamers are included within the scope of this term. When the ester is formed from hydroxy-containing carboxylic acid moieties that can further esterify, such as lactic acid or glycolic acid, the number of repeat units is calculated based upon the number of lactide or glycolide moieties, rather than upon the number of lactic acid or glycolic acid moieties, where a lactide repeat unit contains two lactic acid moieties esterified by their respective hydroxy and carboxy moieties, and where a glycolide repeat unit contains two glycolic acid moieties esterified by their respective hydroxy and carboxy moieties. 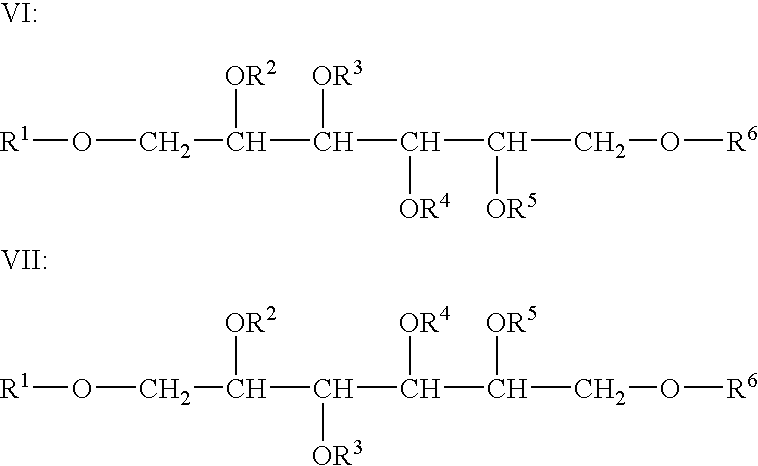 Esters having 1 to about 20 etherified polyols in the alcohol moiety thereof, or 1 to about 10 glycerol moieties in the alcohol moiety thereof, are considered nonpolymeric as that term is used herein. In a particular embodiment, the high viscosity liquid carrier material (HVLCM) decreases in viscosity, in some cases significantly, when mixed with a solvent to form a low viscosity liquid carrier material (LVLCM) that can be administered as a medical or surgical implant, graft, or film, or mixed with a biologically active substance for controlled delivery, or a combination thereof. The LVLCM/biologically active substance composition is typically easier to place in the body than a HVLCM/biologically active substance composition, because it flows more easily into and out of syringes or other implantation means. It also can easily be formulated as an emulsion. The LVLCM can have any desired viscosity, but its viscosity is generally lower than the corresponding HVLCM. As an example, viscosity ranges for the LVLCM of less than approximately 6,000 cP, more particularly, less than approximately 4,000 cP, even more particularly, less than approximately 1,000 cP, and yet even more particularly less than 200 cP, are typically useful for in vivo applications. The particular HVLCM used in the invention can be one or more of a variety of materials. Suitable materials include nonpolymeric esters or mixed esters of one or more carboxylic acids. In a particular embodiment, the ester is formed from carboxylic acids that are esterified with a polyol having from about 2 to about 20 hydroxy moieties, and which may include 1 to about 20 etherified polyols. Particularly suitable carboxylic acids for forming the acid moiety of the ester of the HVLCM include carboxylic acids having one or more hydroxy groups, e.g., those obtained by ring opening alcoholysis of lactones, or cyclic carbonates or by the alcoholysis of carboxylic acid anhydrides. Amino acids are also suitable for forming esters with the polyol. In a particular embodiment, the ester or mixed ester contains an alcohol moiety having one or more terminal hydroxy moieties that have been esterified with one or more carboxylic acids obtained by alcoholysis of a carboxylic acid anhydride, such as a cyclic anhydride. Nonlimiting examples of suitable carboxylic acids that can be esterified to form the HVLCM of the invention include glycolic acid, lactic acid, ε-hydroxycaproic acid, serine, and any corresponding lactones or lactams, trimethylene carbonate, and dioxanone. The hydroxy-containing acids may themselves be further esterified through the reaction of their hydroxy moieties with additional carboxylic acid, which may be the same as or different from other carboxylic acid moieties in the material. Suitable lactones include, but are not limited to, glycolide, lactide, ε-caprolactone, butyrolactone, and valerolactone. Suitable carbonates include but are not limited to trimethylene carbonate and propylene carbonate. The alcohol moiety of the ester or mixed ester may be derived from a polyhydroxy alcohol having from about 2 to about 20 hydroxy groups, and as indicated above, may be formed by etherifying 1 to 20 polyol molecules. 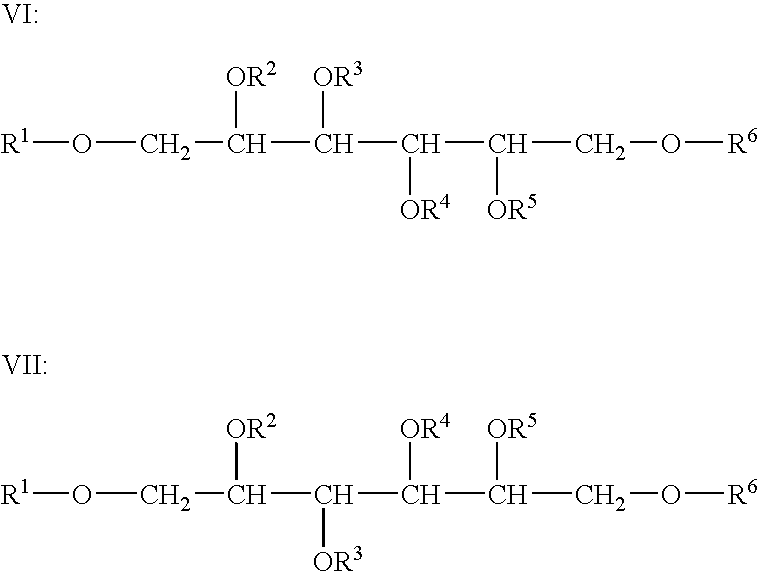 Suitable alcohol moieties include those derived by removing one or more hydrogen atoms from: monofunctional C1-C20 alcohols, difunctional C1-C20 alcohols, trifunctional alcohols, hydroxy-containing carboxylic acids, hydroxy-containing amino acids, phosphate-containing alcohols, tetrafunctional alcohols, sugar alcohols, monosaccharides, and disaccharides, sugar acids, and polyether polyols. More specifically, the alcohol moieties may include one or more of: dodecanol, hexanediol, more particularly, 1,6-hexanediol, glycerol, glycolic acid, lactic acid, hydroxybutyric acid, hydroxyvaleric acid, hydroxycaproic acid, serine, ATP, pentaerythritol, mannitol, sorbitol, glucose, fructose, sucrose, glucuronic acid, polyglycerol ethers containing from 1 to about 10 glycerol units, polyethylene glycols containing 1 to about 20 ethylene glycol units. In particular embodiments of the invention, at least one of the carboxylic acid moieties of the esters or mixed esters of the invention comprise at least one oxy moiety In an even more particular embodiment, each of the carboxylic acid moieties comprise at least one oxy moiety. In another particular embodiment, at least one of the carboxylic acid moieties of the esters or mixed esters of the invention contains 2 to 4 carbon atoms. In an even more particular embodiment, each of the carboxylic acid moieties of the esters or mixed esters of the invention contain 2 to 4 carbon atoms. In another more particular embodiment of the invention, at least one of the carboxylic acid moieties of the ester or mixed ester of the invention has 2 to 4 carbon atoms and contains at least one oxy moiety. In another more particular embodiment of the invention, each of the carboxylic acid moieties of the ester or mixed ester of the invention has 2 to 4 carbon atoms and contains at least one oxy moiety. In a particular embodiment, the HVLCM may be sucrose acetate isobutyrate (SAIB) or some other ester of a sugar alcohol moiety with one or more alkanoic acid moieties. wherein R1, R2, R3, and R4 are independently selected from the group consisting of hydrogen, alkanoyl, hydroxy-substituted alkanoyl, and acyloxy-substituted alkanoyl. In each of formulae I through VIII, one or more of the alkanoyl, hydroxy-substituted alkanoyl, and acyloxy-substituted alkanoyl groups may comprise alkanoyl moieties having 2 to 6 carbon atoms, including the carbonyl carbon. Moreover, in another more particular embodiment of the invention, each of formulae I through VIII comprise at least one hydroxy-substituted or acyloxy-substituted alkanoyl moiety. In an even more particular embodiment, at least one of these hydroxy-substituted or acyloxy-substituted alkanoyl moieties comprise alkanoyl moieties having 2 to 6 carbon atoms, including the carbonyl carbon. The acyl groups forming the acyloxy substituents of the invention may be any moiety derived from a carboxylic acid in accordance with the commonly accepted definition of the term “acyl.” More particularly, the acyl groups of the compositions of the invention may be of the form R9CO—, where R9 is optionally oxy-substituted alkyl of 2-6 carbon atoms. This oxy-substitution may take the form of hydroxy substitution, or substitution with additional acyl moieties. 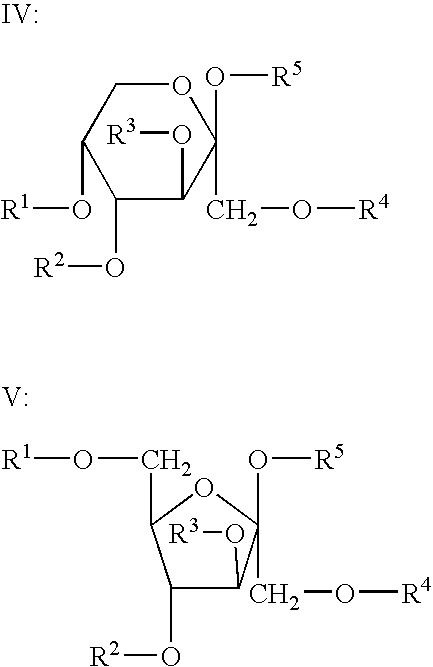 For example R9 may be an oligomer of oxy-substituted carboxylic acids, linked by ester bonding between the hydroxy of one acid and the carboxy of another acid. In a more particular example, R9 may comprise 1 to 5 lactide or glycolide units, where a lactide unit contains two lactic acid moieties esterified together and a glycolide unit contains two glycolic acid moieties esterified together. Alternatively, R9 may contain mixed lactide and glycolide units, or may contain mixed lactic acid and glycolic acid, without the presence of lactide or glycolide units. Particular HVLCM materials include components according to formulae II or 111, wherein R1, R2, and R3 are independently lactoyl, polylactoyl, ε-caproyl, hydroxyacetyl, or polyhydroxyacetyl, in particular, polylactoyl and ε-caproyl, or polylactoyl and polyhydroxyacetyl. The use of relatively small chain (2 to 6 carbon atoms), oxy-substituted carboxylic acid moieties in the ester or mixed ester of the invention is advantageous. When these acid moieties are present in the form of oligomeric esters (i.e., a subsequent acid moiety joined to the previous acid moiety through esterification of the subsequent carboxy with the previous oxy), hydrolysis of the material is considerably easier than for oligomers made with more than 6 carbon atoms because the material is more hydrophilic. In general, for drug delivery it is desired that the HVLCM be water insoluble, but it may be somewhat hydrophilic. In general, HVLCMs synthesized with more hydrophilic units (as determined by a higher O:C ratio) will be expected to absorb water more rapidly and degrade more quickly. For example, a HVLCM made by covalently linking 4 moles of glycolide to one mole of glycerol will be expected to absorb water more rapidly and degrade more quickly than a HVLCM made by covalently linking 2 moles of glycolide and 2 moles of lactide to one mole of glycerol. Similar increases can be expected for more flexible molecules and for more branched, spherical molecules based on free volume arguments. Use of flexible and branched molecules may also have the benefit of lowering the viscosity of the LVLCM. Using carboxylic acids and/or polyols of different chain length and using carboxylic acids having oxy-substitution allows a precise control of the degree of hydrophilicity and of the solubility of the resulting ester. These materials are sufficiently resistant to dissolution in vivo that they are able to provide a controlled release of bioactive substances into the body accompanied or followed by oxy bonds hydrolyzing in vivo. In an even more particular embodiment, the invention excludes the acetate and isobutyrate ester of sucrose having a ratio of acetate to isobutyrate acid moieties of 2:6. However, sucrose acetate isobutyrate ester having a ratio of acetate to isobutyrate moieties of 2:6 is included within the scope of the invention for use in aerosol formulations, as well as for the delivery of lysozyme, paclitaxel, 5-fluorouracil, and antiretroviral drugs like AZT and ddC, as described and exemplified below. This material can be made according to the procedures described in U.S. Pat. No. 2,931,802. In general, the HVLCM esters of the invention can be made by reacting one or more alcohols, in particular one or more polyols, which will form the alcohol moiety of the resulting esters with one or more carboxylic acids, lactones, lactams, carbonates, or anhydrides of the carboxylic acids which will form the acid moieties of the resulting esters. The esterification reaction can be conducted simply by heating, although in some instances addition of a strong acid or strong base esterification catalyst may be used. Alternatively, an esterification catalyst such as stannous 2-ethylhexanoate can be used. The heated reaction mixture, with or without catalyst, is heated with stirring, then dried, e.g., under vacuum, to remove any unreacted starting materials, to produce a liquid product. Sucrose acetate isobutyrates can be made by following the procedures described in U.S. Pat. No. 2,931,802. In this regard, the polyol can be viewed as an oligomerization initiator, in the sense that it provides a substrate for esterification of carboxylic acids, in particular, of oligomers of lactide, glycolide, or other esterified hydroxy-substituted carboxylic acids. As described above, in one embodiment of the invention, the HVLCM can be mixed with a viscosity lowering solvent to form a lower viscosity liquid carrier material (LVLCM), which can then be mixed with the biologically active substance to be delivered, prior to administration. These solvents can be water soluble, non-water soluble, or water miscible, and can include, acetone, benzyl alcohol, benzyl benzoate, N-(betahydroxyethyl)lactamidebutylene glycol, caprolactam, caprolactone, corn oil, decylmethylsulfoxide, dimethyl ether, dimethyl sulfoxide, 1-dodecylazacycloheptan-2-one, ethanol, ethyl acetate, ethyl lactate, ethyl oleate, glycerol, glycofurol (tetraglycol), isopropyl myristate, methyl acetate, methyl ethyl ketone, N-methyl-2-pyrrolidone, MIGLYOLs® (esters of caprylic and/or capric acids with glycerol or alkylene glycols, e.g., MIGLYOL® 810 or 812 (caprylic/capric triglycerides), MIGLYOL® 818 (caprylic/capric/linoleic triglyceride), MIGLYOL® 829 (caprylic/capric/succinic triglyceride), MIGLYOL® 840 (propylene glycol dicaprylate/caprate)), oleic acid, peanut oil, polyethylene glycol, propylene carbonate, 2-pyrrolidone, sesame oil, SOLKETAL ([±]-2,2-dimethyl-1,3-dioxolane-4-methanol), tetrahydrofuran, TRANSCUTOL® (diethylene glycol monoethyl ether, carbitol), triacetin, triethyl citrate, diphenyl phthalate, and combinations thereof. Additionally, if the composition is to be applied as an aerosol, e.g. for topical application, the solvent may be or may include one or more propellants, such as CFC propellants like trichlorofluoromethane and dichlorofluoromethane, non-CFC propellants like tetrafluoroethane (R-134a), 1,1,1,2,3,3,3-heptafluoropropane (R-227), dimethyl ether, propane, and butane. Particularly suitable solvents and/or propellants include benzyl benzoate, benzyl alcohol, triacetin, triethyl citrate, dimethyl sulfoxide, ethanol, ethyl lactate, glycerol, glycofurol (tetraglycol), N-methyl-2-pyrrolidone, MIGLYOL® 810, polyethylene glycol, propylene carbonate, 2-pyrrolidone, and tetrafluoroethane. Other possible solvents include perfluorodecalin, perfluorotributylamine, methoxyflurane, glycerolformal, tetrahydrofurfuryl alcohol, diglyme, and dimethyl isosorbide. When the composition is used as a LVLCM in conjunction with administration of a biologically active substance, it should contain a solvent that the HVLCM is soluble in. In certain instances, the substance to be delivered is also soluble in the solvent. The solvent should be non-toxic and otherwise biocompatible. Solvents that are toxic should not be used for pharmaceutical or agricultural purposes. The solvents used to inject the composition into animals should not cause significant tissue irritation or necrosis at the site of implantation, unless irritation or necrosis is the desired effect. In one embodiment, the solvent should be at least water soluble, so that it will diffuse quickly into bodily fluids or other aqueous environment, causing the composition to coagulate or solidify. In another embodiment, the solvent is not completely miscible with water or bodily fluids so that diffusion of the solvent from the composition, and the corresponding increase in viscosity of the composition, are slowed. Suitable solvents that have this property, at least to some extent, include benzyl benzoate, MIGLYOL® 810, benzyl alcohol, and triethylcitrate. Benzyl alcohol can be particularly suitable, as it also provides an anesthetizing effect, which can relieve discomfort resulting from injection. When esters of 1,6-hexanediol or glycerol are used as the HVLCM, some possible solvents are ethanol, N-methylpyrrolidone, propylene carbonate, and PEG 400. The solvent is typically added to the compositions in an amount in the range from about 0.5 percent to about 99.7 percent, more particularly from about 1 percent to about 95 percent by weight, more particularly from about 5 to about 90 wt %, relative to the total weight of the composition. Even more particularly, the solvent is present in the composition in an amount in the range from about 10 percent to about 55 percent by weight. Other particular ranges include from about 10 percent to 50 percent by weight, and from about 10 to about 30 percent by weight. A further embodiment involves the use of solvents that are not solvents for the HVLCM such that when combined with the HVLCM singularly or in combination with a solvent for the HVLCM, the resulting composition forms an emulsion. Such emulsions may contain the HVLCM in the dispersed phase such as in the case of SAIB/MIGLYOL® mixtures that are emulsified in water or glycerol, or they may contain the HVLCM as a component of the continuous phase such as in the case of an aqueous solution that is emulsified in the HVLCM or a solution of the HVLCM in a water immiscible solvent. When the HVLCM or LVLCM is to be used as a vehicle for delivery or controlled release of a substance to an animal or plant, this substance may be any substance that exhibits a desired property. In a particular embodiment, the substance is a biologically active substance. The term “biologically active substance” as used herein refers to an inorganic or organic molecule including a drug, peptide, protein, carbohydrate (including monosaccharides, oligosaccharides, and polysaccharides), nucleoprotein, mucoprotein, lipoprotein, synthetic polypeptide or protein, or a small molecule linked to a protein, glycoprotein, steroid, nucleic acid (any form of DNA, including cDNA, or RNA, or a fragment thereof), nucleotide, nucleoside, oligonucleotides (including antisense oligonucleotides), gene, lipid, hormone, vitamin, including vitamin C and vitamin E, or combination thereof, that causes a biological effect when administered in vivo to an animal, including but not limited to birds and mammals, including humans. Suitable proteins include, but are not limited to, human growth hormone, fibroblast growth factor (FGF), erythropoietin (EPO), platelet derived growth factor (PDGF), granulocyte colony stimulating factor (g-CSF), bovine somatotropin (BST), tumor necrosis factor (TNF), transforming growth factor-beta (TGF-Beta), interleukins, insulin, and interferons, such as α-interferon, β-interferon, and the like. The term drug, as used herein, refers to any substance used internally or externally as a medicine for the treatment, cure, or prevention of a disease or disorder, and includes but is not limited to immunosuppressants, antioxidants, anesthetics, analgesics, chemotherapeutic agents, steroids (including retinoids), hormones, antibiotics, antivirals, antifungals, antiproliferatives, antihistamines, anticoagulants, antiphotoaging agents, melanotropic peptides, nonsteroidal and steroidal anti-inflammatory compounds, antipsychotics, and radiation absorbers, including UV-absorbers. The term biologically active substance also includes agents such as insecticides, pesticides, fungicides, rodenticides, and plant nutrients and growth promoters. In one embodiment, the composition functions as a vaccine and the substance to be delivered is an antigen. The antigen can be derived from a cell, bacteria, or virus particle, or portion thereof. As defined herein, antigen may be a protein, peptide, polysaccharide, glycoprotein, glycolipid, nucleic acid, or combination thereof, which elicits an immunogenic response in an animal, for example, a mammal, bird, or fish. As defined herein, the immunogenic response can be humoral or cell-mediated. In the event the material to which the immunogenic response is to be directed is poorly antigenic, it may be conjugated to a carrier such as albumin or to a hapten, using standard covalent binding techniques, for example, with one of the several commercially available reagent kits. Examples of preferred antigens include viral proteins such as influenza proteins, human immunodeficiency virus (HIV) proteins, and hepatitis A, B, or C proteins, and bacterial proteins, lipopolysaccharides such as gram negative bacterial cell walls and Neisseria gonorrhea proteins, and parvovirus. The composition of the invention can also be used to elicit both mucosal and systemic immune responses by administration of the HVLCM of the invention, optionally with a solvent to decrease its viscosity as described above, in combination with an immunogenic material, in a vaccine that is administered to a mucosal surface, e.g., intranasally, intravaginally, or intrarectally. The immunogenic material may be any immunogenic agent whose delivery to mucosal tissue is desired. In an even more particular aspect of this embodiment, the HVLCM or LVLCM is selected from formulae II through VIII above. Vaccines of this type can be prepared and administered by delivering an immunogenic material to the mucosal tissues, particularly to the mucosally associated lymphoid tissues of animals, particularly mammals. Administering immunogenic materials, in particular, immunogenic material combined with a carrier containing the non-polymeric, non-water-soluble, high viscosity liquid and a solvent therefore to the folliculi lymphatic aggregati which are found in the mucosal tissues can be an effective delivery technique. The solvent rapidly dissipates, resulting in a highly viscous liquid formulation that holds the immunogenic material over the muscosal tissue and allows the immunogenic material to stimulate a mucosal immune response and/or a systemic immune response. Administration of the formulation may include aerosolizing the formulation or a water emulsion thereof and administering this formulation intranasally, intravaginally (e.g., as a douching liquid, vaginal suppository, or bougie), or intrarectally (e.g., as an enema, suppository or bougie). In particular embodiments, the solvent can be, or the formulation can include, a penetration enhancer that facilitates the absorption of the immunogenic material into the lymphatic tissue. The non-polymeric, non-water-soluble, high viscosity liquid material provides controlled release of the immunogenic material from a viscous liquid film that forms over the lymphoid tissue. The immunogenic material may be any immunogenic agent whose delivery to mucosal tissue, and in particular to mucosally associated lymphoid tissue (MALT), is desired. Even more particularly, the mucosal tissue may be nasally associated lymphoid tissue, Waldeyer's ring, or analogous tissue in non-human species. Examples of suitable immunogenic materials include, but are not limited to, antigens to vaccinate against viral, bacterial, protozoan, fungal diseases such as respiratory syncytial, parainfluenza viruses, Hemophilus influenza, Bordetella pertussis, Neisseria gonorrhoeae, Streptococcus pneumoniae, and Plasmodium falciparum or other diseases caused by pathogenic micro-organisms, antigens to vaccinate against diseases caused by macro-organisms such as helminthic pathogens, antigens to vaccinate against allergens. In another embodiment, the composition functions as a controlled release composition for reproductive therapy, in humans or animals. For example, the HVLCM or LVLCM may be combined with gonadotropin releasing hormone or its analogs or agonists. In a particular aspect of this embodiment, the HVLCM or LVLCM is not SAIB having an acetate to butyrate ratio of 2:6. In an even more particular aspect of this embodiment, the HVLCM or LVLCM is selected from formulae II through VIII above. These compositions can be prepared and administered by following the procedures described for SAIB in U.S. Pat. No. 6,051,558, the entire contents of which are hereby incorporated by reference. Non-limiting examples of pharmacological materials include anti-infectives such as nitrofurazone, sodium propionate, antibiotics, including penicillin, tetracycline, oxytetracycline, chlorotetracycline, bacitracin, nystatin, streptomycin, neomycin, polymyxin, gramicidin, chloramphenicol, erythromycin, and azithromycin; sulfonamides, including sulfacetamide, sulfamethizole, sulfamethazine, sulfadiazine, sulfamerazine, and sulfisoxazole, and anti-virals including idoxuridine; antiallergenics such as antazoline, methapyritene, chlorpheniramine, pyrilamine prophenpyridamine, hydrocortisone, cortisone, hydrocortisone acetate, dexamethasone, dexamethasone 21-phosphate, fluocinolone, triamcinolone, medrysone, prednisolone, prednisolone 21-sodium succinate, and prednisolone acetate; desensitizing agents such as ragweed pollen antigens, hay fever pollen antigens, dust antigen and milk antigen; vaccines such as smallpox, yellow fever, distemper, hog cholera, chicken pox, antivenom, scarlet fever, diphtheria toxoid, tetanus toxoid, pigeon pox, whooping cough, influenzae rabies, mumps, measles, poliomyelitic, and Newcastle disease; decongestants such as phenylephrine, naphazoline, and tetrahydrazoline; miotics and anticholinesterases such as pilocarpine, esperine salicylate, carbachol, diisopropyl fluorophosphate, phospholine iodide, and demecarium bromide; parasympatholytics such as atropine sulfate, cyclopentolate, homatropine, scopolamine, tropicamide, eucatropine, and hydroxyamphetamine; sympathomimetics such as epinephrine; antipsychotics, such as olanzapine, risperidone; narcotic antagonists, such as naltrexone, naloxone, nalnothene; sedatives and hypnotics such as pentobarbital sodium, phenobarbital, secobarbital sodium, codeine, (a-bromoisovaleryl) urea, carbromal; psychic energizers such as 3-(2-aminopropyl)indole acetate and 3-(2-aminobutyl)indole acetate; tranquilizers such as reserpine, chlorpromayline, and thiopropazate; anesthetics, such as benzocaine, bupivacaine, etidocaine, lidocaine, mepivacaine, pramoxine, prilocalne, procaine, proparacaine, ropivacaine, tetracaine, levobupivacaine, chloroprocaine, butacaine, propoxycaine, phenacaine, hexylcaine, isobucaine, cyclomethycaine, benoxinate, diperodon, dibucaine, meprylcaine, dimethisoquin, pramoxine, butamben, dyclonine (with and without augmenting agents such as dexamethasone or epinephrine); tricyclic antidepressants such as amitriptyline or nortryptyline; androgenic steroids such as methyl-testosterone and fluorymesterone; estrogens such as estrone, 17-fl-estradiol, ethinyl estradiol, and diethyl stilbestrol; progestational agents such as progesterone, megestrol, melengestrol, chlormadinone, ethisterone, norethynodrel, 19-norprogesterone, norethindrone, medroxyprogesterone and 17-0-hydroxy-progesterone; humoral agents such as the Prostaglandins, for example PGEI, PGE2 and PGF2; antipyretics such as aspirin, sodium salicylate, and salicylamide; antispasmodics such as atropine, methantheline, papaverine, and methscopolamine bromide; antimalarials such as the 4-aminoquinolines, 8-aminoquinolines, chloroquine, and pyrimethamine, antihistamines such as diphenhydramine, dimenhydrinate, tripelennamine, perphenazine, and chlorphenazine; cardioactive agents such as dibenzhydroflume thiazide, flumethiazide, chlorothiazide, and aminotrate; statins, such as atorvastatin, cerivastatin, fluvastatin, lovastatin, pravastatin, simvastatin, and related compounds; antiasthmatics, such as cromolyn; bone resorption prevention agents, such as bisphosphonates, including as nonlimiting examples alendronate, risendronate, zolendronate, pamidronate, and ibandronate; calcium regulating hormones, such as calcitonin; nutritional agents such as vitamins, natural and synthetic bioactive peptides and proteins, including growth factors, cell adhesion factors, cytokines, and biological response modifiers. The active compound is included in the composition in an amount sufficient to deliver to the host animal or plant an effective amount to achieve a desired effect. The amount of drug or biologically active agent incorporated into the composition depends upon the desired release profile, the concentration of drug required for a biological effect, and the desired period of release of the drug. The concentration of active compound in the composition will also depend on absorption, inactivation, and excretion rates of the drug as well as other factors known to those of skill in the art. It is to be noted that dosage values will also vary with the severity of the condition to be alleviated. It is to be further understood that for any particular subject, specific dosage regimens should be adjusted over time according to the individual need and the professional judgment of the person administering or supervising the administration of the compositions, and that the concentration ranges set forth herein are exemplary only and are not intended to limit the scope or practice of the claimed composition. The composition may be administered in one dosage, or may be divided into a number of smaller doses to be administered at varying intervals of time. The biologically active substance is typically present in the composition in the range from about 0.1 percent to about 90 percent by weight, more particularly from about 0.5 percent to about 70 percent by weight relative to the total weight of the composition, and more typically, between approximately 1 percent to about 50 percent by weight. However, ranges having upper endpoints as low as about 40%, 30%, 20%, or 10% can be used, as can ranges having lower limits as high as about 5%, 3%, or 2%. For very active agents, such as growth factors, preferred ranges are less than 1% by weight, and possibly less than 0.0001%. Both soluble and insoluble substances can be distributed in the HVLCM or LVLCM for controlled delivery. Moreover, the formulations containing biologically active substances and an HVLCM or LVLCM may be further formulated with polymeric excipients to provide a drug delivery matrix with modified properties, for example a faster or slower degradation rate. The resulting composition may be formed into microspheres, or into a macroscopic implant, or other geometries and sizes according to techniques known in the art. Alternatively, a pre-formed microsphere, implant, or polymer/drug particle with a biologically active substance or substances incorporated therein can be combined with the HVLCM or LVLCM. Microspheres may be prepared by a number of methods known in the art, as well as methods described in U.S. Pat. Nos. 6,291,013 and 6,440,493. The polymer/drug particle may be created by melt extrusion, granulation, solvent mixing, or absorption, or the drug may be adsorbed onto a polymer matrix, such as an ion exchange resin. The resulting material, when combined with a biologically active agent and LVLCM, may be administered orally or parenterally. In other embodiments, the drug may be combined with a non-polymeric material, such as calcium phosphate or sucrose, to provide layering/barrier properties that lengthen degradation. The HVLCM or LVLCM will form an secondary barrier to provide enhanced drug delivery. The HVLCM or LVLCM phase may or may not contain other biologically active substances, according to the specific biological requirement. These other biologically active substances may be any of those described above, provided that the biologically active substance must be suitable for incorporation into microspheres or implants according to techniques known in the art. A variety of additives can optionally be added to the HVLCM or LVLCM to modify the properties of the material as desired, and in particular to modify the release properties of the composition with respect to biologically active substances contained therein. The additives can be present in any amount which is sufficient to impart the desired properties to the composition. The amount of additive used will in general be a function of the nature of the additive and the effect to be achieved, and can be easily determined by the routineer. Suitable additives are described in U.S. Pat. No. 5,747,058, the entire contents of which are hereby incorporated by reference. More particularly, suitable additives include water, biodegradable polymers, non-biodegradable polymers, natural oils, synthetic oils, carbohydrates or carbohydrate derivatives, inorganic salts, BSA (bovine serum albumin), surfactants, organic compounds, such as sugars, and organic salts, such as sodium citrate. Some of these classes of additives are described in more detail below. In general, the less water soluble, i.e., the more lipophilic, the additive, the more it will decrease the rate of release of the substrate, compared to the same composition without the additive. In addition, it may be desirable to include additives that increase properties such as the strength or the porosity of the composition. The addition of additives can also be used to lengthen the delivery time for the active ingredient, making the composition suitable for treatment of disorders or conditions responsive to longer term administration. Suitable additives in this regard include those disclosed in U.S. Pat. No. 5,747,058. In particular, suitable additives for this purpose include polymeric additives, such as cellulosic polymers and biodegradable polymers. Suitable cellulosic polymers include cellulose acetates, cellulose ethers, and cellulose acetate butyrates. Suitable biodegradable polymers include polylactones, polyanhydrides, and polyorthoesters, in particular, polylactic acid, polyglycolic acid, polycaprolactone, and copolymers thereof. When present, the additive is typically present in the compositions in an amount in the range from about 0.01 percent to about 20 percent by weight, more particularly from about 0.1 percent to about 20 percent by weight, relative to the total weight of the composition, and more typically, is present in the composition in an amount in the range from about 1, 2, or 5 percent to about 10 percent by weight. Certain additives, such as buffers, are only present in small amounts in the composition. The following categories are nonlimiting examples of classes of additives that can be employed in the composition. Given the disclosure herein and the objects to be achieved, one of skill in the art will easily know how to select other additives to achieve a desired purpose. All of these embodiments are considered to fall within the disclosed invention. One category of additives are biodegradable polymers and oligomers. The polymers can be used to alter the release profile of the substance to be delivered, to add integrity to the composition, or to otherwise modify the properties of the composition. Non-limiting examples of suitable biodegradable polymers and oligomers include: poly(lactide), poly(lactide-co-glycolide), poly(glycolide), poly(caprolactone), polyamides, polyanhydrides, polyamino acids, polyorthoesters, polycyanoacrylates, poly(phosphazines), poly(phosphoesters), polyesteramides, polydioxanones, polyacetals, polyketals, polycarbonates, polyorthocarbonates, degradable polyurethanes, polyhydroxybutyrates, polyhydroxyvalerates, polyalkylene oxalates, polyalkylene succinates, poly(malic acid), chitin, chitosan, and copolymers, terpolymers, oxidized cellulose, or combinations or mixtures of the above materials. 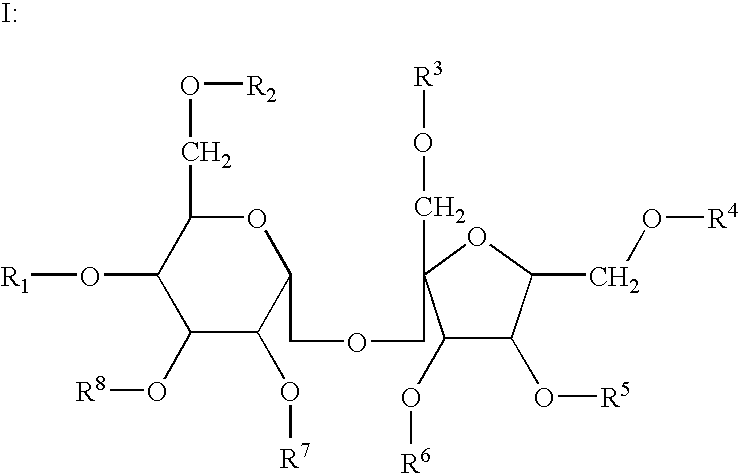 Examples of poly(α-hydroxy acid)s include poly(glycolic acid), poly(DL-lactic acid) and poly(L-lactic acid), and their copolymers. Examples of polylactones include poly(ε-caprolactone), poly(δ-valerolactone) and poly(γ-butyrolactone). While not wishing to be bound by any theory, it is believed that when the composition contains a biodegradeable polymer, a portion of the polymer may precipitate or coagulate at the surface of the composition as the solvent diffuses away from the material after administration to the patient. The polymer may have been added as a release modifying agent to affect the release of a biologically active compound, or may have been added as part of a composition containing preformed microspheres, implants, or ground polymer particles. The precipitation or coagulation of the polymer forms a skin at least partially surrounding the liquid core of the composition. This skin is porous, and allows the solvent to continue to diffuse through it into surrounding tissue. The rate of solvent release and the extent of formation of the skin, as well as its porosity, can be controlled by the amount and type of solvent and polymer used in the composition. Another additive for use with the present compositions are non-biodegradable polymers. Non-limiting examples of nonerodible polymers which can be used as additives include: polyacrylates, ethylene-vinyl acetate polymers, cellulose and cellulose derivatives, acyl substituted cellulose acetates and derivatives thereof, non-erodible polyurethanes, polystyrenes, polyvinyl chloride, polyvinyl fluoride, polyvinyl (imidazole), chlorosulphonated polyolefins, polyethylene oxide, and polyethylene. Preferred non-biodegradable polymers include polyvinyl pyrrolidone, ethylene vinylacetate, polyethylene glycol, cellulose acetate butyrate (“CAB”) and cellulose acetate propionate (“CAP”). A further class of additives which can be used in the present compositions are natural and synthetic oils and fats. Oils derived from animals or from plant seeds of nuts typically include glycerides of the fatty acids, chiefly oleic, palmitic, stearic, and linoleic. As a rule the more hydrogen the molecule contains the thicker the oil becomes. Non-limiting examples of suitable natural and synthetic oils include vegetable oil, peanut oil, medium chain triglycerides, soybean oil, almond oil, olive oil, sesame oil, fennel oil, camellia oil, corn oil, castor oil, cotton seed oil, and soybean oil, either crude or refined, and medium chain fatty acid triglycerides. Fats are typically glyceryl esters of higher fatty acids such as stearic and palmitic. Such esters and their mixtures are solids at room temperatures and exhibit crystalline structure. Lard and tallow are examples. In general oils and fats increase the hydrophobicity of the HVLCM, slowing degradation and water uptake. Another class of additives which can be used in the present compositions are carbohydrates and carbohydrate derivatives. Non-limiting examples of these compounds include monosaccarides (simple sugars such as fructose and its isomer glucose (dextrose); disaccharides such as sucrose, maltose, cellobiose, and lactose; and polysaccharides. Another class of additives includes multivalent metals, such as zinc, useful in ionic form as protein stabilizers. The zinc may be present in the formulation as zinc carbonate, zinc acetate, zinc sulfate, zinc chloride, or other zinc salts as appropriate. Other non-limiting examples of compounds to provide metal cations in the formulation include magnesium carbonate, calcium carbonate, magnesium acetate, magnesium sulfate, magnesium chloride, magnesium oxide, magnesium hydroxide, and the like. The amount of such agents used in the formulation will depend upon the amount of protein in the formulation and the nature of the interaction between the protein and the stabilizer. The composition described herein can be administered to the host through a variety of methods which can vary depending on the result to be achieved. When the host is an animal, such as a human, the composition can be administered, for example, topically, systematically (for example, mucosally (orally, rectally, vaginally, or nasally), parenterally (intravenously, subcutaneously, intramuscularly, or intraperitoneally), or through the pulmonary system, in an appropriate carrier, if desired. When the composition is used for administration to humans or animals, or used for agricultural purposes, it can be applied via injection, pouring, spray dip, aerosol, or coating applicator. Aerosols or mists of the composition can be administered using an aerosol propellant, e.g., for topical administration, or using a suitable nebulizer, e.g., for pulmonary, nasal, or oral mucosal administration. In addition, pericardial administration may be used when the composition is used to deliver compounds such as growth factors (e.g., transforming growth factors (TGF's), fibroblast growth factors (FGF's), vascular endothelial growth factor (VEGF)), antiarrhythmics (e.g., sotalol, propanolol), antianginals, and antihypertensives. Preferably, for pharmaceutical or veterinary purposes, the present compositions are administered as liquids via injection, or in an aerosol, paste or emulsion. When administered via injection as a LVLCM, if a water-soluble solvent has been used in the composition, the solvent leaches into the aqueous fluid of the host, forming a highly viscous depot for the controlled delivery of substances or a coating for tissue that can prevent or minimize adhesions. As explained above, the use of a water soluble solvent in making the LVLCM significantly decreases the leaching time. When used in an aerosol, the small amount of solvent in the solution evaporates upon application allowing the LVLCM to set-up as an HVLCM. Alternatively, the aerosol or emulsion may be prepared without a solvent. In this situation, the aerosol propellant can also function as a solvent. Formation of aerosols and emulsions can be accomplished using techniques known to those skilled in the art. See, for example, Ansel, H. C. et al., Pharmaceutical Dosage Forms and Drug Delivery Systems, sixth ed., 1995. In addition to the uses described above, the HVLCM and LVLCM materials can be administered through osmotic pumps. In one embodiment, the device is designed to be implanted in the tissue of the patient, and designed to effect sustained release over time. In a different embodiment, the device is orally administrable, such as an OROS-type osmotic pump. An example of an implantable osmotic pump suitable for use with the compositions of the invention is the DUROS pump, described in U.S. Pat. Nos. 5,985,305 and 5,728,396, and in WO 97/27840, the entire contents of each of which are incorporated herein by reference. It is also possible to administer the compositions of the invention using a porous or nonporous tube, desirably made of extruded biodegradeable polymer. The tube may be prepared with varying degrees of porosity depending on the characteristics of the composition and the release characteristics desired. The composition of the invention is inserted into the tube, and the ends of the tube may be left open, allowing biologically active compound to diffuse out of the ends of the tube, or may be closed off with additional porous or nonporous polymer. Porous endcaps and porous tubes allow active compound to diffuse through the pores over time. Nonporous endcaps, as well as nonporous tubes, allow biologically active compounds that are soluble in the polymer to diffuse through it and into surrounding tissues. Nonporous materials that are not solvents for the biologically active compound, but that are biodegradable, will release the active compounds when they degrade sufficiently. The compositions of the invention may be prepared and stored as multi-component systems until ready for administration. The number of different components will depend, in part, on the characteristics of the composition. For example, one component may contain the HVLCM or LVLCM, while other components contain the active compound or compounds to be administered. Prior to administration, the components are combined and mixed, e.g., to achieve a homogeneous composition, which can then be administered to the patient. Solvents or additives may be added to one or all of the components, or may form a separate component, which is also mixed with the others prior to administration. Separation of the composition into a multicomponent mixture allows the storage conditions for each component to be optimized, and minimizes any detrimental interactions between components over time. The result is increased storage stability. The compositions can be used to form protective tissue coatings, and in particular, can be used to prevent the formation of surgical adhesions. The HVLCM can adhere to the surrounding tissue or bone, and can thus be injected subdermally like collagen to build up tissue or to fill in defects. It can also be injected into wounds including burn wounds to prevent the formation of deep scars. The degradation time of the HVLCM can be modulated, for example, by using a polymer as an additive to the HVLCM. Then the implant formed by the HVLCM will slowly biodegrade within the body and allow natural tissue to grow and replace the implant as it disappears. These compositions may optionally contain biologically active substances including but not limited to, anesthetics, analgesics, antibiotics, and antinflammatories. As indicated above, the HVLCM and LVLCM materials of the invention can be used not only for the controlled release and delivery of substances, such as bioactive substances, to plants or animals, but also as medical or surgical devices, as described in U.S. Pat. No. 5,968,542, the entire contents of which are incorporated by reference. Device utilities for the compositions of the invention include, but are not limited to blocking surgical adhesions, void filling, guided tissue regeneration, inducing hemostasis, tissue adhesive, scaffolding, and wound dressing. Each of these applications can optionally include release of a biologically active substance, or drug delivery. For example, the nonpolymeric ester or mixed ester composition as a wound dressing readily accommodates various growth factors to accelerate healing of the wound. In general, for these utilities a composition can be used having the non-polymeric non-water-soluble liquid carrier material present in an amount from about 99.5 percent to about 25 percent by weight, relative to the total weight of the composition. These compositions can be diluted with a solvent, including but not limited to one or more of ethanol, dimethylsulfoxide, ethyl lactate, ethyl acetate, benzyl alcohol, triacetin, 2-pyrrolidone, N-methylpyrrolidone, propylene carbonate, glycofurol, capric/caprylic triglycerides, benzyl benzoate, ethyl oleate, isopropyl myristate, triethyl citrate, and any aerosol propellant, to a concentration of the non-polymeric non-water-soluble liquid carrier material of about 10 to about 90% by weight, calculated based on the total weight of the composition, to obtain an implantable or sprayable composition. For blocking surgical adhesions, a sprayed-on or painted-on film to block adhesion of similar or dissimilar organs is suitable. The nonpolymeric ester or mixed ester composition is formulated in any of a variety of solvents, including ethanol, ethyl lactate, N-methyl-2-pyrrolidone, or any common aerosol propellant, dimethyl ether, or any propellant, with or without an additive, and can be applied as an aerosol spray. The resulting film may effect adhesion, cohesion, degradation or porosity, or a combination thereto. For void filling, the nonpolymeric ester or mixed ester composition is typically suitable like collagen for cosmetic repair. In related applications, the nonpolymeric ester or mixed ester composition is useful for holding bone chips together in a fracture, and may optionally include an anesthetic, antibiotic, or growth factor for local delivery. Guided tissue regeneration is another application, such as periodontal repair to block epithelial migration. Advantageously, the compositions of the present invention are applied from solution. Typical drugs incorporated into these compositions for guided tissue regeneration include but are not limited to a variety of growth factors and cell reattachment factors. Hemostasis or stopping blood flow is another utility, typically in a surgical setting. The compositions of the present invention are biodegradable. Suitable additives include, but are not limited to polyvinyl alcohol, polyethylene glycol or carboxymethyl cellulose. Suitable solvents include ethyl lactate and propylene carbonate. A spray-on or paint-on formulation of the nonpolymeric ester or mixed ester composition is suitable as a tissue adhesive for wound closure, either as a primary sealant or in conjunction with sutures or staples. Suitable additives include but are not limited to carboxymethylcellulose or polyvinylpyrrolidone. Suitable solvents include but are not limited to propylene carbonate, ethyl lactate, glycofural, dimethylsulfoxide, 2-pyrrolidone, N-methyl-2-pyrrolidone, and ethanol. Biologically active substances incorporated into these compositions for tissue adhesion include but are not limited to antibiotics, anti-inflammatory compounds, analgesics, anesthetics and growth factors. Scaffolding is another device utility for the compositions of the present invention, and is particularly adaptive to new tissue growth. A typical formulation includes polyvinylpyrrolidone and tricalcium phosphate. The scaffolding provides a matrix suitable for the attachment and growth of bone or nerve cells. Biologically active substances incorporated into these compositions for scaffolding include but are not limited to growth factors. Another application of the compositions of the present invention is a wound dressing, with or without appropriate drugs incorporated therein. The wound dressing functions to protect the wound and accelerate the healing process. In one typical application, the nonpolymeric ester or mixed ester composition is applied as an aerosol spray. Biologically active substances incorporated into these compositions in wound dressing include but are not limited to antibiotics, such as amikacin, anti-inflammatory compounds, analgesics, anesthetics, or growth factors such as fibroblast growth factors. Alternatively, the nonpolymeric ester or mixed ester composition with the biologically active substance is applied to a gauze or other matrix material which is then applied to the wound. Whether the compositions of the invention are used as for controlled release delivery of biologically active substances, or as devices or implants, the compositions can have very high viscosities. As described above, the HVLCM materials have a viscosity at 37° C. of at least 5,000 cP. In a more particular embodiment, the HVLCM materials have viscosities above 10,000 cP, more particularly above 15,000 cP, even more particularly above 20,000, 25,000, or 50,000 cP at 37° C.
As apparent from the discussion above, the amount of HVLCM present in the composition may vary considerably, depending upon such factors as the number and amount of other components included in the composition, the use to which the composition will be put, and the method of administration of the composition. In general the HVLCM can be present in amounts as high as 99.5 wt % to much lower amounts, provided that the HVLCM continues to perform its function as a carrier material. Lower limits of 45 wt %, 25 wt %, 10 wt %, or even 1 wt % or lessare contemplated, depending upon the factors mentioned above. For example, an emulsion may use 0.03 wt %. Examples of applications where lower concentrations of HVLCM may be useful include: oil in water emulsion, where the active compound is dissolved or suspended in the HVLCM, which is then suspended in a continuous phase (e.g., an aqueous phase) as an emulsion; formulations where the HVLCM functions to enhance the solubility of the active compound in the formulations; and formulations where only a slight increase in delayed release is desired. A clean, one liter glass reaction flask was fitted with a stainless steel mechanical stirrer rinsed with acetone, and dried for 3 hours under 0.5 mm Hg vacuum, while immersed in a 150° C. oil bath. The reaction vessel was removed from the bath, allowed to cool, then charged with 197.5 grams (1.37 mol) of DL-Lactide, 52.5 grams (0.46 mol) of ε-Caprolactone, and 40 grams (0.34 mol) of 1,6-Hexanediol. Following addition, the reaction flask was purged 5 times with nitrogen, and immersed in the oil bath at 150° C. The mixture was stirred slowly after a majority appeared to have been melted to facilitate phase change. After all contents had melted, 1.28 mL (210 μmol) of a 0.164M stannous 2-ethylhexanoate solution in toluene was added. Stirring continued to disperse the catalyst for a period of approximately 1 hour. The solution was maintained, without stirring, for 18 hrs. at 150° C. The resulting compound was then dried under vacuum (<0.5 mm Hg) at 150° C. for a period of 4-5 hours to remove any unreacted starting materials, with slow stir speed applied. The resulting product had an inherent viscosity of 0.049 dL/g in CHCl3 at 30° C.
The procedure detailed in Example 1 was used to prepare a material using 247.13 g (1.71 mol) DL-Lactide, 62.87 g (0.54 mol) Glycolide, and 49.6 g (0.42 mol) 1,6-Hexanediol. Following initial melting, 1.84 mL (260 μmol) of a 0.141M stannous 2-ethylhexanoate solution in toluene was added. The resulting product had an inherent viscosity of 0.058 dL/g in CHCl3 at 30° C. The material was a liquid at room temperature. The procedure described in Example 1 was used to prepare a material using 198.14 g (1.37 mol) DL-Lactide, 54.8 g (0.47 mol) ε-caprolactone, and 40 g (0.43 mol) Glycerol. Following initial melting, 1.36 mL (210 μmol) of a 0.154M stannous 2-ethylhexanoate solution in toluene was added. The resulting product had an inherent viscosity of 0.038 dL/g in CHCl3 at 30° C. The product was a liquid at room temperature. The procedure described in Example 1 was used to prepare a compound using 247.33 g (1.72 mol) DL-Lactide, 62.87 g (0.54 mol) Glycolide, and 50.0 g (0.54 mol) Glycerol. Following initial melting, 1.46 mL (260 μmol) of a 0.179M stannous 2-ethylhexanoate solution in toluene was added. The resulting product had an inherent viscosity of 0.028 dL/g in CHCl3 at 30° C. The material was a liquid at room temperature. A clean, one liter glass reaction flask was fitted with a stainless steel mechanical stirrer rinsed with acetone, and dried for 3 hours under 0.5 mm Hg vacuum, while immersed in a 150° C. oil bath. The reaction vessel was removed from the bath, allowed to cool, then charged with 174 grams (1.5 mol) of glycolide and 92 grams (1.0 mol) of glycerol. Following addition, the reaction flask was purged 5 times with nitrogen, and immersed in the oil bath at 150° C. The mixture was stirred slowly to facilitate phase change after a majority of the mixture appeared to have been melted. After all contents had melted, 1.28 mL (210 μmol) of a 0.164M stannous 2-ethylhexanoate solution in toluene was added. Stirring was continued to disperse the catalyst for a period of approximately 1 hour. The solution was maintained, without stirring, for 18 hrs. at 150° C. The resulting compound was then dried under vacuum (<0.5 mm Hg) at 150° C. for a period of 4-5 hours with slow stir speed applied to remove any unreacted starting materials. The procedure described in Example 5 was used to prepare a material using 513 gms (4.5 mol) ε-caprolactone and 93 g (0.5 mol) 1-dodecanol. Following addition of reagents, 1.36 mL (210 μmol) of a 0.154M stannous 2-ethylhexanoate solution in toluene was added. The reaction proceeded as described in Example 5 and was purified as described therein. Methods of using the compositions of the invention are exemplified below. CAPROL 10G4O (decaglycerol tetraoleate) was dissolved in benzyl benzoate at a weight ratio of 50:50. Bupivacaine was dissolved in this mixture at a concentration of 8.75 wt %. Drops weighing approximately 100 mg were precipitated into a test tube containing 40 mL of buffer. Samples of the buffer were removed at specified time points and replaced with fresh buffer. The samples were analyzed by UV-vis spectrophotometry at 265 nm to determine the concentration of bupivacaine in each buffer sample. At 4 hours, less than 7.5 wt % of the bupivacaine in the drop had been released to the buffer. At 48 hours, around 24.0 wt % of the bupivacaine had been released. The cumulative release profile is shown in FIG. 1. The 1,6-hexanediol lactate ε-hydroxycaproic acid produced in Example 1 was dissolved in N-methylpyrrolidone at a weight ratio of 70:30. 10 wt % bupivacaine base was then added to this mixture and dissolved. Drops weighing approximately 100 mg were precipitated into 40 mL buffer. Samples of buffer were removed at specified times and replaced with fresh buffer. Buffer samples were analyzed by UV-vis spectrophotometry at 265 nm to determine the concentration of bupivacaine in each buffer sample. At 4 hours, around 4.1 wt % of the bupivacaine contained in the precipitated drop had been released. At 24 hours, around 8.6 wt % of the bupivacaine had been released. The cumulative release profile is shown in FIG. 1. The glycerol lactate glycolate prepared according to Example 4 was dissolved in ethanol at a weight ratio of 70:30. 10 wt % estradiol was then added to this mixture as a suspension. The formulation was homogenized prior to testing to ensure adequate mixing. Drops of this formulation were injected into a test tube containing buffer. The glycerol lactate glycolate precipitated, forming a depot from which the estradiol was slowly released. Samples of the buffer were removed at specified times and replaced with fresh buffer. The buffer samples removed from each test tube were analyzed by UV-vis spectrophotometry at 280 nm to determine the estradiol concentration in each sample. The assayed concentration was used to calculate the percent of estradiol released from the drop. FIG. 2 shows a cumulative release profile for estradiol. The 1,6-hexanediol lactate glycolate prepared according to Example 2 was dissolved in propylene carbonate at a weight ratio of 80:20. 10 wt % of progesterone was incorporated as a suspension into this mixture. The formulation was homogenized prior to testing to ensure adequate mixing. The resulting formulation was analyzed to determine its in vitro dissolution profile. Drops of the formulation were injected into a test tube containing buffer. The 1,6-hexanediol lactate glycolate precipitated, forming a depot from which the progesterone was slowly released. Samples of the buffer were removed at specified times and replaced with fresh buffer. The buffer samples were analyzed by UV-vis spectrophotometry at 244 nm to determine drug concentration in each sample. The assayed concentration was used to calculate the percentage of progesterone that had been released from the drop. The cumulative release profile is shown in FIG. 3. The glycerol lactate ε-hydroxycaproic acid prepared according to Example 3 was dissolved in polyethylene glycol (PEG) 400 at a weight ratio of 36:64. Lysozyme was ground with a mortar and pestle and the resulting powder was incorporated into the mixture as a suspension at a concentration of 10 wt %. The formulation was mixed thoroughly with a spatula. Samples of the formulation, approximately 500 μL in volume, were injected into three test tubes each containing 10 mL of buffer. Aliquots of buffer (8 mL) were removed at specified times and replaced with fresh buffer. Each sample of buffer containing lysozyme was analyzed with a micro BCA protein assay reagent kit to determine protein content in the dissolution sample. The assayed lysozyme concentration was used to calculate the percent of lysozyme that had been released from the drop. The cumulative release profile is shown in FIG. 4. CAPROL 6G2O (hexaglycerol dioleate) was dissolved in benzyl benzoate at a weight ratio of 25:75. Lysozyme was ground with a mortar and pestle and the resulting powder was incorporated into the mixture as a suspension at a concentration of 10 wt %. The formulation was mixed thoroughly with a spatula. Samples of the formulation, approximately 500 μL in volume, were injected into three test tubes each containing 10 mL of buffer. Aliquots of buffer (8 mL) were removed at specified times and replaced with fresh buffer. Each sample of buffer containing lysozyme was analyzed with a micro BCA protein assay reagent kit to determine protein content in the dissolution sample. The assayed lysozyme concentration was used to calculate the percent of lysozyme that had been released from the drop. The cumulative release profile is shown in FIG. 4. Two solutions were prepared in which 1,6-hexanediol lactate ε-hydroxycaproic acid (prepared according to Example 1) and 1,6-hexanediol lactate glycolate (prepared according to Example 2) were dissolved in polyethylene glycol (PEG) 400 at weight ratios of 34:66 and 33:67, respectively. A drop of each formulation was injected into a test tube containing deionized water, and the 1,6-hexanediol lactate s-hydroxycaproic acid and 1,6-hexanediol lactate glycolate were precipitated at the bottom of the test tubes. The drops retained their shapes for longer than one week. The formulations listed in the Table below were prepared using the esters prepared in Examples 1 through 4. In each case, the mixture resulted in a homogeneous solution. 5.33 g of a 10 wt % solution of bupivacaine in a composition containing 70:30 SAIB/NMP, prepared as described in U.S. Pat. No. 5,747,058, was added to an aerosol container. 14.32 g of propellant R-134a (1,1,1,2-tetrafluoroethane) was added. The mixture formed a solution that was easily sprayed with no bubbling or foaming. 5.44 g of a 10 wt % solution of bupivacaine in a composition containing 70:30 SAIB/NMP, prepared as described in U.S. Pat. No. 5,747,058, was added to an aerosol container. 16.55 g. of propellant R-134a (1,1,1,2-tetrafluoroethane) was added. The mixture formed a solution that was easily sprayed with no bubbling or foaming. 0.87 g of bupivacaine base was added to an aerosol container. 8.47 g of an SAIB/propylene carbonate solution (70:30) containing 2.5 wt % of a biodegradable polymer (65:35 DLPLG) was added to the container. 0.98 g of ethanol was added to help the drug dissolve. Once dissolved, approximately 16 g of propellant R-134a (1,1,1,2-tetrafluoroethane) was added. The mixture formed a solution that was easily sprayed with no bubbling or foaming. SAIB was dissolved in propellants 134a (1,1,1,2-tetrafluoroethane) and 227 (1,1,1,2,3,3,3-heptafluoropropane) at levels of 5 and 10 wt %. Clear solutions were formed. An additional example was conducted to evaluate a novel controlled-release system, which uses a high-viscosity compound, sucrose acetate isobutyrate (SAIB), for use in providing sustained release of lysozyme. A small amount of solvent converts SAIB to an easily injectable liquid. Once injected, the solvent dissipates forming a high viscosity, biodegradable implant. Release profiles can be altered with different solvents and additives. Ground lysozyme (10 wt %) was suspended in SAIB/solvent mixtures including the solvents ethyl lactate, N-methyl-2-pyrrolidone (NMP), MIGLYOL 810, and benzyl benzoate. Three poly (DL-lactide-co-glycolide) polymers with either acid, ester, or PEG end groups were evaluated as additives. To determine release rates, drops of formulation were injected into test tubes with pH 6.24 buffer and then incubated in a shaker at 37° C. At certain times, aliquots of buffer were removed and replaced with fresh buffer. Lysozyme concentration in buffer was determined by the BCA protein assay. Protein activity was determined with an enzymatic assay measuring cell lysis of a suspension of Micrococcus lysodeikticus spectrophotometrically. Decrease in absorbance at 450 nm was recorded as a function of time, which is directly related to active lysozyme concentration. At 6 hours, release ranged from 1.3 wt % for the 70:30 SAIB/NMP formulation (110.3±5.0% activity) to 4.5 wt % for the 40:60 SAIB/ethyl lactate formulation (107.6±6.1% activity). The percent released at 7 days ranged from 46.7% for 40:60 SAIB/ethyl lactate (88.9±6.8% activity) to 96.4% for 70:30 SAIB/MIGLYOL (107.6±7.0% activity). Addition of 0.5 wt % of each of the three polymers to an SAIB/NMP formulation did not significantly affect the release profile. These results demonstrate that the SAIB/solvent delivery system described above is capable of providing sustained release of proteins in an active state, and that the rate of release can be modulated to provide a range of release profiles. An additional example was conducted to evaluate the effects of formulation variables on release of chemotherapeutic agents—paclitaxel and 5-fluorouracil (5-FU)—from formulations based on an SAIB delivery system. It will be understood from the description above that the SAIB delivery system uses sucrose acetate isobutyrate (SAIB), a fully-esterified, water-insoluble sucrose derivative, as an excipient. It can be formulated as a low- to medium-viscosity liquid by the addition of small amounts of solvents such as ethanol, MIGLYOL, ethyl lactate, propylene carbonate, or DMSO, resulting in an easily injectable formulation. Solutions of SAIB in the appropriate solvent were prepared with and without the incorporation of an additive. The active was weighed into a test tube and the SAIB/mixture was added and mixed thoroughly to yield a solution or suspension at the desired drug loading. Single drops of the mixture were precipitated into buffer by injection with standard syringes and needles. Samples were maintained at 37° C. in a shaker, sampled periodically, and analyzed by UV-vis spectrophotometry for active release. Paclitaxel and 5-FU samples were analyzed at 232 nm and 266 nm, respectively. The effect of drug loading was evaluated for paclitaxel. Drug loadings of 5, 25, and 50 mg/mL were compared. After 7 days, the cumulative release for these three drug loading were 106.4%, 85.9%, and 33.8%, respectively. The effect of surfactant additives was also evaluated. A 25 mg/mL paclitaxel formulation and a 10 mg/mL 5-FU formulation, both in 85:15 SAIB/EtOH, were made and 5 wt % Cremophor® EL was added. The addition of this surfactant increased the rate of release for both formulations. The percent released from the paclitaxel formulation increased from 56.0% to 77.0% after two days in vitro. Likewise, the percent released from the 5-FU formulation increased from 80.6% to 106.0% after two days. A second surfactant, Pluronic® L-101, was added to a 10 mg/mL 5-FU in 85:15 SAIB/EtOH formulation. This surfactant also increased the amount released from 80.6% to 102.0% after two days. The rate of release of drugs such as paclitaxel and 5-fluorouracil from the SAIB delivery system can be modulated by formulation variables including drug loading and surfactant type. Also, the duration of release of these drugs from this system can be varied from a few hours to several days with the shorter duration seen at the lower drug loading and with the addition of a surfactant. Another example was conducted to evaluate the potential of the SAIB delivery system to provide extended release following oral administration of antiretroviral drugs used for treating HIV infections. As indicated above, the SAIB delivery system uses sucrose acetate isobutyrate (SAIB), a fully-esterified, water-insoluble sucrose derivative, as an excipient. Zidovudine (AZT) and dideoxycytodine (ddC) suspensions were prepared by mixing drug with SAIB/solvent solutions with and without a cellulosic coexcipient. Approximately 1 g of each formulation was filled into soft gelatin capsules, which were heat sealed. Dissolution profiles were determined using Apparatus 2, Method B (USP XXIII) at a paddle speed of 50 rpm. Individual gelcaps were placed in separate dissolution vessels, and samples of the buffer in each vessel were obtained at 0.25, 0.5, 1, 2, 3, 6, and 24 hours. The samples were analyzed at 266 and 272 nm on a Perkin Elmer Lambda 20 UV-vis spectrophotometer for AZT and ddC drug content, respectively. Release of AZT and ddC can be modulated simply by the use of different solvents in the SAIB delivery system. By using a 70:30 SAIB/Migylol® 810 combination, the cumulative percent released at 2 hours for an 11.1 wt % AZT formulation was 104.1% and 74.2% for a 0.225 wt % ddC formulation. Comparatively, when an 85:15 SAIB/EtOH combination was used, 71.2% of the drug in the AZT formulation had been released and 59.5% of the drug in the ddC formulation. Release can also be modified by altering drug loading. When the active loading of an 85:15 SAIB/EtOH formulation was doubled from 11.1 to 22.2 wt %, the cumulative percent released was increased from 71.2% to 93.8%. The use of a polymeric additive, cellulose acetate butyrate (CAB), to modulate release was also evaluated. For an 11.1 wt % AZT in 85:15 SAIB/EtOH formulation, addition of 0.02 and 0.2 wt % CAB decreased the amount released at 2 hours from 71.2% to 25.6% and 7.6%, respectively. For a 0.225 wt % ddC in 85:15 SAIB/EtOH formulation, addition of 0.5 and 1.0 wt % CAB decreased the amount released at 2 hours from 59.5% to 39.4% and 13.5%, respectively. These data show that formulations of the SAIB delivery system can be modified to provide a range of dissolution profiles for AZT and ddC. By providing controlled release of these actives, this system can reduce the number of pills needed per day, reduce cost of manufacture, and improve patient compliance. A depot formulation was prepared by suspending 0.83 g of a 3:2 (w/w) solid mixture of cromolyn sodium (disodium cromoglycate) and polycaprolactone (PCL, Birmingham Polymers, Inc.) in 9.17 g of a 70:30 (w/w) mixture of SAIB and benzyl benzoate. The solid cromolyn sodium/PCL mixture was prepared by dissolving 12 g PCL in 100 mL of methylene chloride and mixing 18 g cromolyn sodium into this solution. The solution was poured onto TEFLON film, and the methylene chloride evaporated to a solid film, which was then ground into particles, which were then added to the SAIB/benzyl benzoate mixture. The resulting depot suspension was incubated and assayed to determine the rate of cromolyn release. The formulation was found to release a cumulative total of about 9 mg or 10% of available cromolyn over a 35-day period as shown in FIG. 5. A hollow tube of 65:35 poly(dl-lactide-co-glycolide) containing 5 wt % PEG-1000 as a porosigen is extruded on a Randcastle extruder using a standard tubing dye. The resulting hollow rods, having a diameter of 2.0 mm are cut to the desired length of 20 mm and filled with a mixture of SAIB and fibroblast growth factor (FGF). The rod ends are closed by heat sealing. The rods are assayed for release of FGF by placing them in 40 mL of HEPES dissolution buffer at 37° C. without agitation. After approximately 1 hour incubation, 5 mL of buffer solution is removed for analysis and replaced with fresh buffer. Daily sampling is conducted, and the samples analyzed for FGF content by ELISA. The formulation shows a release lag of 2 days, followed by release of about 3 wt % of the original FGF loading per day for 30 days. The present invention having been thus described, variations and modifications thereof as would be apparent to those of skill in the art will be understood to be within the scope of the appended claims. 46. A composition for the controlled release delivery of a substance, said composition comprising sucrose acetate isobutyrate (SAIB) and a substance to be delivered. 47. The composition of claim 46, wherein the substance to be delivered is a biologically active substance. 48. The composition of claim 47, wherein the biologically active substance is a drug, peptide, protein, carbohydrate, nucleoprotein, mucoprotein, lipoprotein, synthetic polypeptide or protein, or a small molecule linked to a protein, glycoprotein, steroid, nucleic acid or a fragment thereof, nucleotide, nucleoside, oligonucleotide, gene, lipid, hormone or vitamin. 49. The composition of claim 48, wherein the drug is an immunosuppressant, antioxidant, anesthetic, chemotherapeutic agent, steroid, hormone, antibiotic, antiviral, antifungal, antiproliferative, antihistamine, anticoagulant, antiphotoaging agent, melanotropic peptide, nonsteroidal or steroidal anti-inflammatory compound, antipsychotic or a radiation absorber. 50. The composition of claim 49, wherein the anesthetic is selected from the group consisting of benzocaine, bupivacaine, levobupivacaine, lidocaine, mepivacaine, prilocalne, procaine, ropivacaine, and tetracaine. 51. The composition of claim 46, wherein said composition is suitable for administration by injection. 52. The composition of claim 46, wherein said composition is suitable for forming a medical or surgical implant. ES2340044T3 (en) 2010-05-28 Polyoxyalkylene copolymer mixtures as a biomaterial for administration or drug delivery and modification of surfaces.